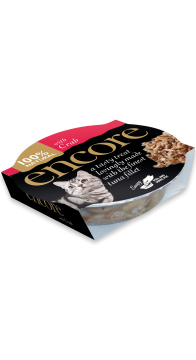 Encore tins, pots and pouches are lovingly made with the very best ingredients – fish caught fresh from the sea and the finest chicken breast. 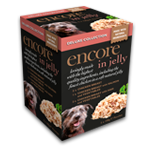 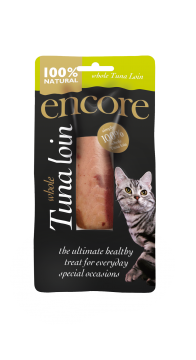 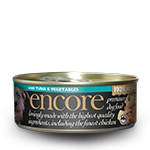 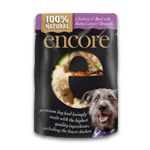 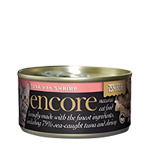 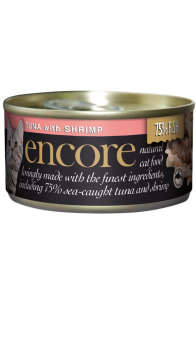 Encore is the real meat, complementary cat food with all natural ingredients, containing succulent chicken breast and tasty fillets like tuna, mackerel, sardine or salmon (all caught from sustainable species using dolphin friendly fishing methods). 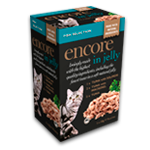 These Encore recipes provide a great source of essential amino acids such as Taurine and Arginine to keep your cat’s health in tip-top condition. 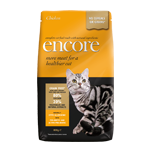 The Encore range also includes complete wet and dry foods so you can provide your cat with a naturally balanced diet. 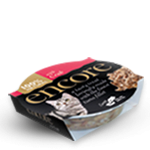 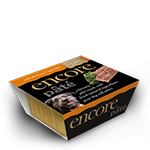 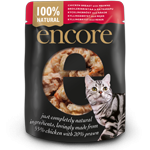 Encore Loins are the ultimate luxurious healthy cat treat. 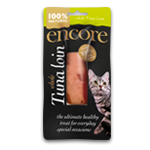 Recipes created to give your cat lots of variety to sample, with ranges of tuna to prime cuts of chicken. 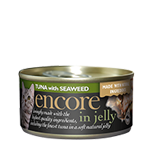 Your cat will adore this tasty treat in a unique, see-through dish - simply peal and serve, no need for a bowl. 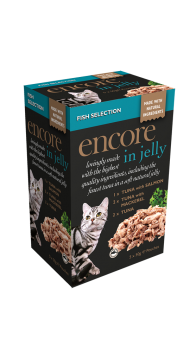 Recipes created to give your cat lots of variety to sample, with everything from ocean fish to prime cuts of chicken. 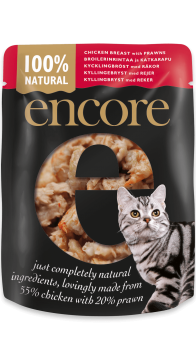 We've created the World's first see-through pouch, so you can see for yourself how appetising our flavours are before you buy. 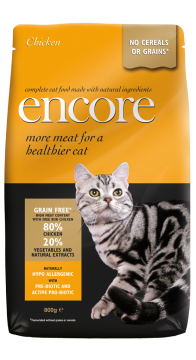 A complete dry food made with natural ingredients - grain free with 80% lean animal protein for a very healthy and happy cat.